I love strawberries and I love this strawberry Lassi Recipe. Strawberry lassi or strawberry smoothie is a quick recipe. It is a very satisfying cool drink in the hot summer afternoon. It can be served as a snack or along with or after dinner. It is a nutritious drink. Whenever strawberries are available, I use them to make this strawberry lassi. Strawberries are eaten by themselves or many deserts and sweets are made with ripe strawberries such as strawberry ice cream, strawberry burfi etc. This strawberry lassie recipe is one such ripe strawberry recipe. You may use fresh or frozen strawberries for this lassi. You may also use strawberry pulp or puree if fresh strawberries are not available. There is no artificial flavor or color added to this. The strawberries you choose give it a natural flavor and color. So choose your strawberries with care. 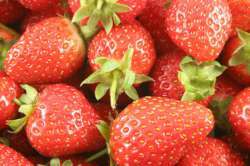 Select only ripe and sweet strawberries. You may also use canned / tinned strawberries for this strawberry lassie recipe. You may not need to use sugar at all. You may use the ready strawberry pulp too. Sugar - 1tbsp, more or less according to taste. Put the strawberry pieces, sugar, curd/yogurt in the blender. Blend till it becomes smooth. Add milk. Blend again till frothy. Fill tall glasses with lassi. Add a few slices of strawberries on the top and serve. Top with vanilla or strawberry ice cream or a few pieces of strawberry. To make strawberry lassi choose ripe, sweet strawberries. Sour strawberries may curdle the milk. Use fresh, naturally sweet curd (yogurt). Adding milk makes the lassi more frothy and thicker. You may add water along with or instead of milk. But remember, lassi tastes better with milk. Sugar quantity will depend on the sweetness of strawberries, freshness and sweetness of the curd. And also on your sweet tooth. You may add a scoop of ice cream while blending too. Tastes great and gives good consistency. Enjoy your strawberry smoothie - lassi.